The proceedings of the 9th International Conference on Internet, Law & Politics (IDP 2013): Challenges and Opportunities of Online Entertainment are already available for download. Content, besides some minor editing, has followed the originals, so the reader will find articles both in Spanish or English. Balcells, J., Cerrillo i MartÃ­nez, A., Peguera, M., PeÃ±a-LÃ³pez, I., PifarrÃ© de Moner, M.J., & Vilasau Solana, M. (coords.) (2012). Big Data. Retos y Oportunidades. Actas del IX Congreso Internacional, Internet, Derecho y PolÃ­tica. Universitat Oberta de Catalunya, Barcelona 25-26 Junio, 2013. Barcelona: UOC-Huygens Editorial. Balcells, J., Cerrillo i MartÃ­nez, A., Peguera, M., PeÃ±a-LÃ³pez, I., PifarrÃ© de Moner, M.J., & Vilasau Solana, M. (coords.) (2012). Big Data. Challenges and Opportunities. Proceedings of the 9th International Conference on Internet, Law & Politics. Universitat Oberta de Catalunya, Barcelona 25-26 June, 2012. Barcelona: UOC-Huygens Editorial. Peña-López, I. 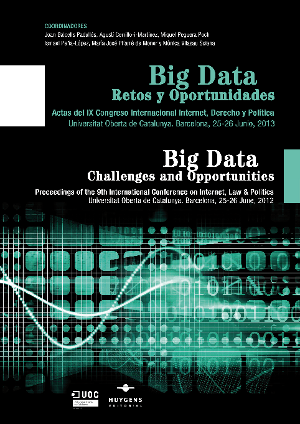 (2013) “Big Data: Challenges and Opportunities. Proceedings of the 9th International Conference on Internet, Law & Politics” In ICTlogy, #117, June 2013. Barcelona: ICTlogy. Moderadora: MÃ²nica Vilasau. Lecturer, School of Law and Political Science (UOC). Peña-López, I. (2013) “IDP2013 (X): Privacy (II)” In ICTlogy, #117, June 2013. Barcelona: ICTlogy. The dramatic growth of participation in social networking sites can be approached from the international private law. Users normally accept all the terms of conditions of social networking sites. But what law is to be applied? It depends. In these terms it is normally stated what law and what jurisdiction is to be applied. Thus, the user is not protected by the law as there is a high degree of defencelessness as they have to deal with “foreign” laws most of the times. Alessandro Mantelero, Polytechnic University of Turin; Giuseppe Vaciago, University of Insubria. There is an asymmetric distribution of the control over information. Interaction between the private and the public sector is mediated by these data and this imbalance of power. There is a political and strategical value of the European regulation on data protection, as there is a predominance of US companies in the ICT sector, which implies an influence of the US administration on national companies. Indeed, is not only about jurisdiction in terms of what law applies, but also the fact that most data of European citizens are stored overseas (usually in the US). An added political/strategic/security issue, then, is that the US Administration can require the firms in US soil (e.g. most of all in cloud services) to access all the data in their silos. Data portability reduces the risk of lock in as it allows for transferring data from one place to another. In this sense, it also reduces monopolistic practices, reduces the power of the service provider and eases establishing more balanced regulation. What are the challenges that big data poses in the field of e-Health? Many uses so far: drug data extracted from prescription records, devide data collected from implantable cardiac devices, clinical data collected form medical records and medical images, claims and financial data, patient behaviour and sentiment data, etc. All these are already transforming healthcare. But there are many privacy concerns, most of the related to the possibility to “re-identify” patients even if their respective data has been anonymised. Another concern is the right to be forgotten in relationship with health records. Maybe we have to move from what to protect to how to protect. BarbarÃ : is consent enough to protect the citizen? Is it informed enough to count as valid? Ricardo Morte: if there are issues with jurisdiction, it is very likely that the citizen cannot appeal to the Constitutional Court. Is that this way? Is there any “equivalent” at the international/European level? Ortega: the problem comes not in what falls within the framework of the (commercial) agreement, which is quite well contemplated by the current regulation, but in what falls outside of the framework of the agreement, in what is extra-contractual. Peña-López, I. (2013) “IDP2013 (IX): Privacy (I)” In ICTlogy, #117, June 2013. Barcelona: ICTlogy. Moderator: Rosa Borge. Lecturer, School of Law and Political Science (UOC). Javier Toret, Researcher and activist. Author of TecnopolÃ­tica: la potencia de las multitudes conectadas. El sistema red 15M, un nuevo paradigma de la polÃ­tica distribuida. This research has a different approach from the usual one: there is no theory that aims at being validated by data, but lots of data, an event, that is being analysed to see whether a theory or an explanation can be inferred. Hacking + activism + netstrike = hacktivism. Technopolitics. The crisis is a necessary but not sufficient condition for the movement to take place. The narrative and the previous experiences on the net, the evolution of memes (memethics) and campaigns, etc. are very important to set up the movements. In this sense, there is a “migration” of hashtags across several movements. On the other hand, most of the people that participated were already users of social networking sites. And not only social networking sites, but social movements in general: there is a powerful online-offline hybridization of participation. Technopolitics is not cyberactivism, because it also happens outside of the net; and it is not slacktivism, because there is much more than just uncommitted online politics. Multilayer approach: the physical layer, the media layer, the technological layer, etc. Technopolitics is becoming a pattern, and an important one, all over the world’s politics. Again, there is a high correlation between the online and the offline world, between Facebook groups and local (physical/offline) groups. A technologically structured contagion took place during the indignados movement. How does this contagion happens? Emotions play a major role, are central in the movement. Emotions, vocabulary, etc. are really synced during the movement, especially during offline events (and their replica online). It is important to note the different organizational structures between parties — hierarchic, isolated — and the movement — decentralized, networked. Central question in social science research: behaviour, communication, information dynamics. And methodological challenges: influence networks, actor attributes and roles, context and case studies. What are the consequences of social media use on mobilization and diffusion? What are the bridges and commonalities between computer and social sciences? The aim of the research is finding what is the state of the art of research in the field of mobilization and its relationship with social networking sites. A literature review for the period 2007-2013 was carried on. Diffusion is based on the adoption of a practice or features through different channels. It depends on the message, the information dynamics, actors and the network structure. Some organizations play key roles in some mobilization processes, and specifically, the resources of these organizations. These resources can also be social capital, linkages and opportunities. The relationship between actors, indeed, can tell us much about the probability that a movement can go on, can evolve, can grow. Organizations are usually “sense makers”, they provide good explanations for what is happening in reality, they provide frames, scenarios, diagnosis, identify the main subjects. We know little, though, how the context changes, what are the group dynamics. Concerning future research, we have to take into account the diffusion processes that involve information dynamics but also practices (tractics, strategies) and cultural norms. On the other hand, are we putting to much hope on Twitter or other social networking sites? We have also to analyze network linkages, formal structures vs. communication dynamics. Peña-López, I. (2013) “IDP2013 (VIII): Social Movements” In ICTlogy, #117, June 2013. Barcelona: ICTlogy. Moderator: Ana SofÃ­a Cardenal. Lecturer, School of Law and Political Science (UOC). Ismael PeÃ±a-LÃ³pez. Lecturer, School of Law and Political Science (UOC).